Young leaves are very susceptible to Phomopsis leaf blight. The disease can also weaken older leaves in perennial plantings resulting in reduced yields the following year. In the southeast during nursery production, severe defoliation may occur and daughter plants may wilt and die due to infection of runners with symptoms that are often confused with anthracnose. The disease is considered a “summer” disease and therefore can be a problem in the southeast during nursery production or in carry-over plantings. The pathogen may also come in with transplants and the disease may build-up in the fall in annual plasticulture fruiting fields. (Rarely does it build up to levels of concern). The pathogen infects leaves, but may also affect the runners and daughter plants decreasing nursery plant yields. This disease is one of the primary diseases that require fungicides in the Southeastern nursery fields. Reddish purple spots 3⁄8” to 1⁄2” in diameter develop on leaflets and eventually enlarge to become V-shaped and delineated by major leaf veins (Figure SS-1, Figure SS-4) and the disease may potentially causing severe defoliation (Figure SS-2). The enlarged lesions develop a dark brown central zone surrounded by a lighter brown zone. An outer zone of purple, red or yellow can also develop. Numerous pycnidia develop in the center of the spot. The fungus may also infect petioles, stolons, calyxes and fruit. Entire stems may be killed when petioles and trusses become completely girdled with black to purple, elongate, and sunken lesions. Fruit lesions can be circular (Figure SS-3) and are different than, but could be confused with, anthracnose. Proper diagnosis is important since Phomopsis is less of a concern than anthracnose. Figure SS-1: Phomopsis leaf blight in a nursery in NC. Lesions are of different sizes and toward the right several lesions coalesced to cause a large triangular blighted area. Figure SS-2: Phomopsis leaf blight in a nursery in NC showing extensive defoliation and a range of lesion sizes on leaves. Figure SS-3: Fruit lesions believed to be caused by Phomopsis. (Full verification was never made; presence of pycnidia would verify the pathogen; suspect fruit with Phomopsis would be welcome to secure confident pictures). Figure SS-4: V-shaped blighted areas on a Strawberry leaf affected by Phomopsis leaf blight. Young leaves are very susceptible to Phomopsis leaf blight. The disease can also weaken older leaves in perennial plantings resulting in reduced yields the following year. 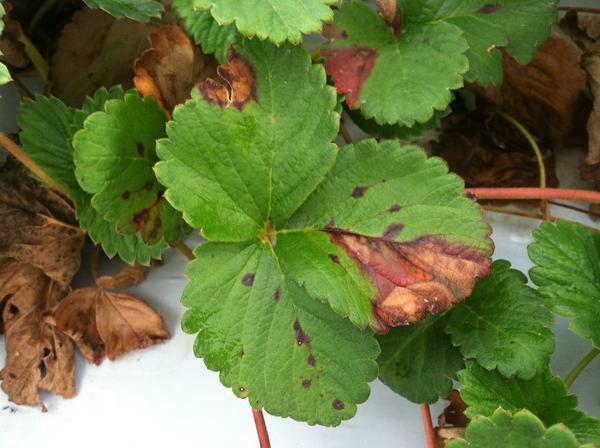 The pathogen probably comes from other plant species growing nearby strawberry nursery fields. In perennial fruit production systems, the leaf blight pathogen may overwinter in lesions on plants with infected leaves, while in annual systems the fungus is typically introduced on transplants or tips. Disease generally occurs in late summer or fall and is favored by wet weather. Primary infection occurs by rain-splashed spores, which are not airborne (over long distances). In fruiting fields in North Carolina and surrounding states, some defoliation may occur but observations suggest levels of disease commonly observed do not impact yield. Therefore, these pathogens are not included in regulatory or certification programs as action items. There is a limited amount of research on this pathogen and its impact in annual production systems. The pathogen is also known to infect ripe berries during warm wet spring conditions but this problem (in terms of economic impact) has occurred rarely in our region. No specific measures have been developed for the control of leaf blight in annual systems and no varieties contain high levels of resistance to this pathogen. Broad spectrum fungicides (captan, thiram) offer some control and fungicides with a specific mode of action also offer control (e.g. Rally, possibly the QoI or strobilurins). In matted row systems, the application of broad spectrum fungicides or mixes after harvest until late summer may be effective, followed by mowing of older leaves to reduce inoculum; this strategy is ineffective unless leaves are later removed or tilled into the soil. 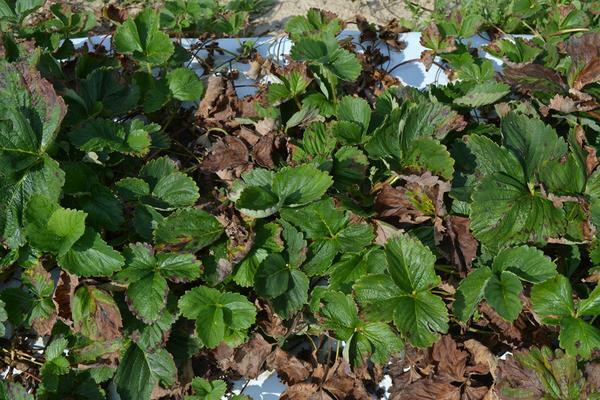 Products, rates and timing are highlighted in our Strawberry IPM Guide. Phomopsis obscurans is an asexual, disease-causing fungus that infects strawberry leaves. The pycnidia of P. obscurans are produced on the upper surface of leaves and are immersed, black, globose (140-210 µm) and have short protruding ostiolar necks. Conidia (5.5-7.5 x 1.5-2 µm) are hyaline, unicellular and fusiform. Each conidium has two to three guttulae with one guttula at each end of the spore. The conidia are borne on hyaline conidiophores that are vertically to irregularly branched and measure up to 85 µm long. Under humid conditions conidia are extruded from pycnidia in long, gelatinous tendrils or in globular masses. Conidia are exuded in mass as tendrils or globules and usually have a pale amber color. On potato dextrose agar (PDA), colonies form sparse aerial white hyphae. Colonies of P. obscurans on PDA form sparse, white aerial mycelia. Pycnidia are distributed irregularly in the colony but occur most often near the point of inoculation and tend to be larger in culture than those in leaf lesions. Sporulation in culture on PDA requires light or the inclusion of strawberry leaf extract in the medium. If fruiting structures are absent on affected sample, individual leaves or leaflets may be incubated in a moist chamber for 24-48 hours to induce sporulation. When placed under moist conditions, pycnidia form and can swell to several times their normal size, extending well above the surface of the leaf. The presence of condia with 2-3 guttulae per spore is also diagnostic for this disease (Maas, 1998). Eshenaur, B. C., and Milholland, R. D. 1989. Factors influencing the growth of Phomopsis obscurans and disease development on strawberry leaf and runner tissue. Plant Disease 73:814-819. Maas, J. L. 1998. Compendium of Strawberry Diseases, 2nd edition. APS Press. St. Paul, MN.